Guys, I can’t take total credit for this recipe. I first had this salad when I was having lunch in Tryst, the best coffee shop/restaurant/bar/art studio/music venue in D.C. I have been to many coffee shops before that have tried to pull off the hipster coffee restaurant bar with a tribute to the arts, and it usually comes across as a case of mistaken identity. Or schizophrenia. However, Tryst somehow blends all these interests seamlessly while being able to maintain a décor of mismatched couches, tables, and a tin-tiled ceiling. If you are in D.C., definitely go check out Tryst. Anyway, I had this salad on a hot August day in D.C. For any of you that have been lucky enough to visit D.C. in the dog days of summer, you know what I am talking about. D.C.is so. Humid. I ordered this salad after a day of walking through the city for a full day in summer. Watermelon sounded great, mostly because it would be cold and full of water, but I wasn’t sure what to expect. The combination of fruit, mint, goat cheese, and balsamic sounded odd. Super odd. Of course, at this point, you know how the story ends, since I wouldn’t be posting this recipe if I didn’t love it. This salad is now my favorite go-to when summer days are getting hot and long. 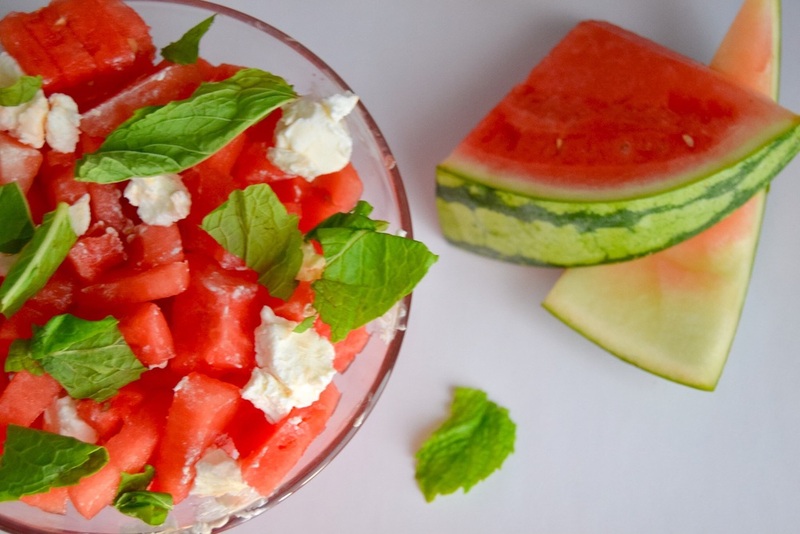 There are so many combinations of watermelon, goat cheese, and mint salads out there, proving that it seems to be a great summer staple. Most recipes, including the original I tried from Tryst, use a balsamic reduction as a dressing. However, this recipe here on South of Vanilla just uses a balsamic-olive oil combination. I did this for a couple reasons, the first being that as it gets hotter out, I just get lazier. Granted, a reduction isn’t a ton of work, but when the temperatures start to soar past 3 digits, I tend to not want to be close to anything hot, which includes a stovetop. The second reason I veered away from a reduction was simply because I personally prefer to dilute balsamic with a bit of oil because balsamic is a bit too strong for my personal tastes. But of course, tweak this recipe as you wish, just promise me that you will try it. It is way too good to pass up! This salad comes together very quickly, however, only make just before serving; it doesn’t sit well. In grocery stores, fresh whole mint leaves are usually sold in packages of .5-.75 oz. I like to use .5 oz., of mint, because I feel like more is overpowering, however, feel free to add more according to your tastes. Goat cheese isn't paleo, however, some people can tolerate dairy from goats much, much better than cows. I used seedless watermelon to save myself some time removing the seeds. If you're concerned about hybrid fruit vs. GMOs here is a good article. Place diced watermelon in a large bowl. 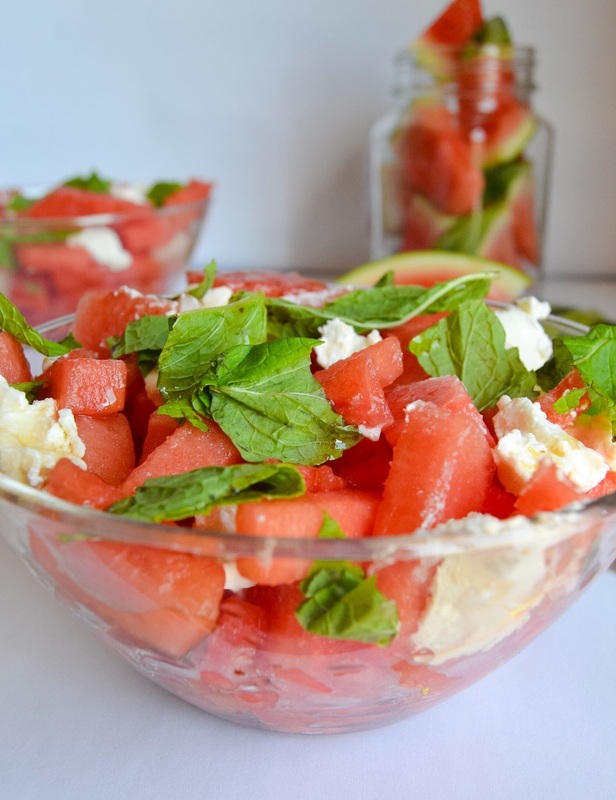 Crumble goat cheese into diced watermelon. Add mint, leaving some mint leaves whole, but tearing bigger leaves with fingers into pieces. Whisk olive oil and balsamic vinegar together. Drizzle on top of salad and mix well. Serve immediately.